Between September 14 and 20, 2015, Alpinist contributor Craig Muderlak posted his art, photos and stories on our Instagram, Facebook and Twitter pages as part of our Alpinist Community project. Muderlak's artwork has been featured on both our website and in Alpinist 50 and 51. I'm interested in more than sharing [pictures of hard] climbing or beautiful landscapes. I consider my illustrations an outward expression of the human experience originating from the pursuit of climbing. This is a 3D rendering of an illustration named "Three Patriarchs," published in Alpinist 51. The illustration is mixed media on paper and was created a few years ago after bailing from Tricks of the Trade (5.10+ C2, 1,800', Hatcher-Middendorf-Quinn, 1993) in Zion National Park. Years ago I instructed a NOLS course in the Waddington Range of coastal British Columbia. On day two, after progressing a mere six kilometers, one of our student's boot soles delaminated. 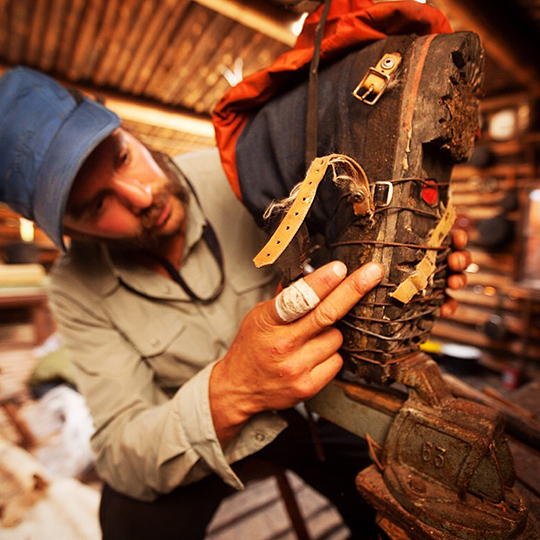 Serendipitously, we came across an old abandoned trapper cabin equipped with tools including a vice, nails and bailing wire, which we used to fix the boot. It turned out that these boots belonged to the student's father who perished in a rockfall the previous year on Mt. Hood, Oregon. We fixed the boots and went on to traverse the Waddington Range for the next month. Some landscapes are iconic for a reason—even a sculptor couldn't improve upon their perfection. I make no attempt at mimicking their beauty; rather I explore my internal experience in response to their grandeur. This is a 3D rendering of "Half Dome Script" with original music. I'm in the process of creating illustrations and animations for a film in progress about our minds in the mountains. Pictured here is a time-lapse and original music of an illustration named "Be With Me On the Mountain, Be With Me in My Mind #1" of the summit cone of Mt. Waddington. I've always thought of wild places as having a restorative effect, fostering a sense of peace, wellbeing, and balance that makes me feel alive. 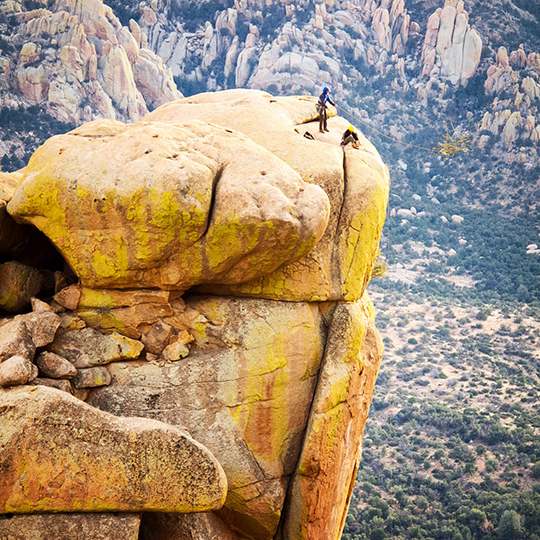 Cochise Stronghold in Southern Arizona is one of these places. This photograph of a team of climbers rappelling off of Whale Dome was taken from the top of Ghost Dome." The Wind River Mountains are composed of convoluted valleys and ridges extending in every direction, glacially carved cirques and alpine lakes. Seen here is a 3D rendering of my "Cirque Dreams" illustration and original music featuring the Cirque of the Towers skyline. 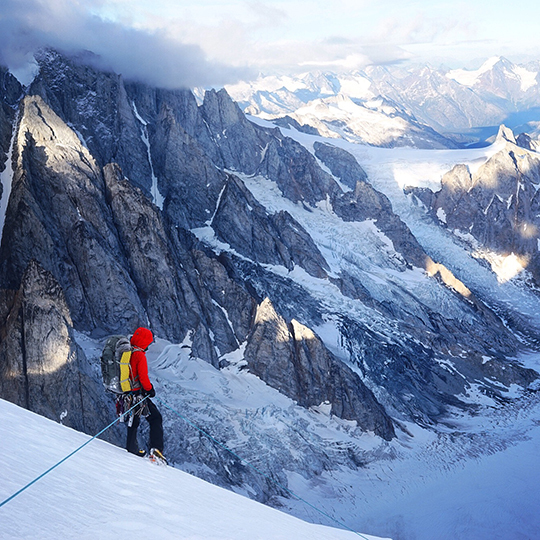 I recently returned from an expedition to the Waddington Range with Drew Thayer. This trip was partially supported with a grant from The American Alpine Club. Here Drew is seen retreating from high up on Mt. Waddington with the Tiedemann Glacier 5,000 feet below. We had some big climbing objectives planned, but ended up retreating multiple times, hunkering down, climbing through inclement weather. We were also caught off guard by fickle conditions and inaccurate forecasts. To see more of Muderlak's work, check out his website, or follow him on Facebook and Instagram.